FastWebHost is an industry leader which is a affordable business web hosting solutions in India. They are privately held medium size company, debt free and profitable. It is one of the fastest growing hosting companies with over 2,00,000 rock solid support, domains, and acclaimed network infrastructure. 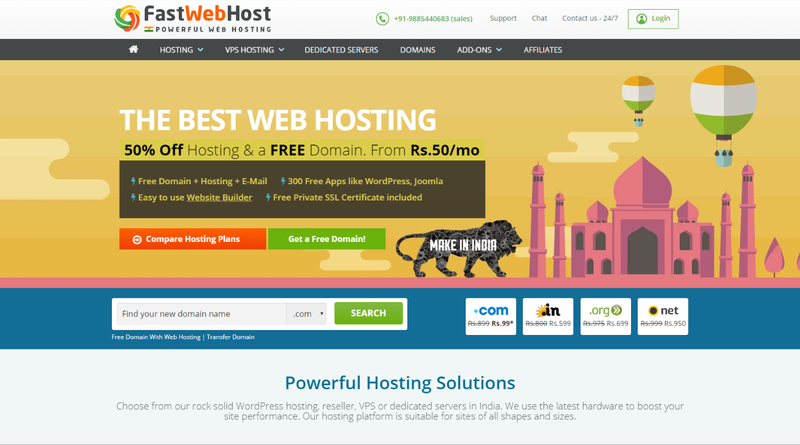 In FastWebHost their basic price starts from Rs.50/mo for web hosting, Reseller Hosting Rs.400/mo, VPS Hosting Rs.175/mo, and for Windows Hosting Rs.50/mo.They provide Free Domain Name unlimited web space, host unlimited websites, unlimited bandwidth, unlimited email accounts, free website builder, high priority support, Real People Helping 24×7, 1-Click App Installer, Free Website Builder and many more. FastWebHost understands their customers need for outstanding service and are 100% committed to their clients’ service standards. They have put together a complete solution to help your website online quickly and easily, also to promote your website and to profit with your site. Their service and sales hosting specialists are here to assist you and are recognized as some the brightest, most devoted and the friendliest staff in the web hosting business. FastWebHost provides cPanel which is a fully featured web-based control panel. Using cPanel, you can manage all aspects of your site FTP manager, File Manager, Secure FTP, 1-click auto installers, CDN, SEO tools, Spam Protection, URL redirect tool including e-mail, files, backups, CGI scripts, web site statistics and many more. FastWebHost Provides well follows up on its words when they say they give you 24/7 customer support and service, available in form of Phone, live chat and online help help desk and they are also have broad learning base, tutorials and FAQs which covers almost every question related to hosting.